The graduate student composers in the program in Composition and Computer Technologies in UVA's McIntire Department of Music invite you to a concert of works for voices, performed by members of the acclaimed Ekmeles ensemble. From susurration to clamorous harmonies, from text-sound meta-composition to SABB dub for cosmic dancers -- there is something for everyone! The concert is the capstone event of Ekmeles' residency, generously supported by the Office of the Vice Provost of the Arts. The concert will be held at 8:00 PM on Friday, February 21, at the Thomas Jefferson Memorial Church. Admission is free. All are welcome! In Ancient Greek music theory, an adjective used to describe tones of indefinite pitch and intervals with complex ratios, tones "not appropriate for musical usage." 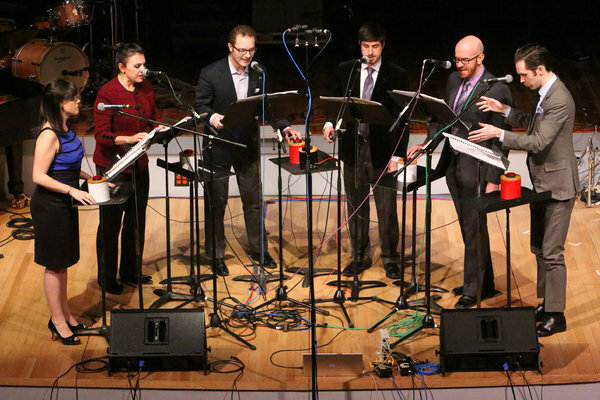 In New York City, a new vocal ensemble breathing life into those disallowed tones, new and old. Ekmeles is praised for their “extraordinary sense of pitch” by the New York Times, and called a “promising addition to the New York scene” by the New Yorker’s Alex Ross. New York is home to a vibrant instrumental New Music scene, with a relative paucity of vocal music. Ekmeles was founded to fill the gap by presenting new a cappella repertoire for solo voices, and by collaborating with these instrumental ensembles. Recent collaborations include the US Premiere of Beat Furrer's FAMA with Talea Ensemble, the US Premiere of Luigi Nono’s Quando Stanno Morendo with AMP New Music, and two concerts of 10 world premieres by Columbia University and New York University composers. Other performances include a program at Columbia University’s Italian Academy entitled Madrigals and Metamorphoses, two nights of Christopher Cerrone’s opera Invisible Cities with Red Light New Music, and a collaboration with violinist Mary Rowell of Knee Plays from Philip Glass’s Einstein on the Beach at Issue Project Room. Director Jeffrey Gavett brings a hybrid vision to the group: he is an accomplished ensemble singer and performer of new works, and holds degrees from Westminster Choir College and Manhattan School of Music's Contemporary Performance Program. He has assembled a virtuoso group of colleagues with diverse backgrounds, ranging from the operatic stages of Europe to Anglican choirs of men and boys, which they bring to the unique challenges of this essential and neglected repertoire. - Workshop: Thu Feb 20, 2014; 3:30pm; Old Cabell Hall room 107 - Members of Ekmeles lead a discussion and workshop on new music for voices. - Concert: Fri Feb 21, 2014; 8pm; Thomas Jefferson Memorial Church 717 Rugby Road - Members of Ekmeles perform new compositions by UVa graduate students. Review of Ekmeles in The New York Times. This residency is sponsored by the Office of the Vice Provost of the Arts.